Besides my Alice in Wonderland embroidery I also took my hexies with me on holiday! Fabric, thread (several colours), needles and scissors all fitted nicely into the cookie tin I bought while I was in London earlier this year. :) It turned out to be a perfect crafty holiday activity. 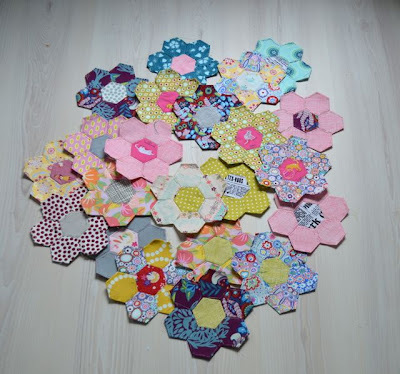 I sewed my hexagon-flowers in the sun, in the cottage, in the car... The Heather Ross cat ones are possibly my favorites! And these are all the hexies I made so far! Not entirely sure what I will do with them though...so I'm just soldiering on until I find the perfect pattern. The Hexy MF is still a very tempting option of course. For my embroidery peeps: on the &Stitches blog we have a great series called Summer Bloggin' you need to check out if haven't already. We had great posts from Julie about making mini-samplers and last week DoubleT wrote her first post about Blackwork embroidery. Very inspiring stuff! In a few days time I will post some photos of the 'Lucky' Bunny embroidery I'm still working on. I have a new camera now and I hope that I will be able to show you some nice details! I love the cats too! Very kitsch. I think they would make a very good Hexy MF. Look forward to seeing what they become! Actually I do need papers but I'm using a different size than is used with the Hexy MF quilt along, not sure if that is a problem? Mailing you! Love them! I have a UFO hexie project. Anxious to see what yours become and be inspired. Very cute & how addicitive are they ....I have been looking at getting some precut papers as I cut my own last time & its not very accurate which got frustrating for me !! feel I will cave in pretty soon !! I'm not even thinking of cutting my own! Oh, such lovely kitty fabric. 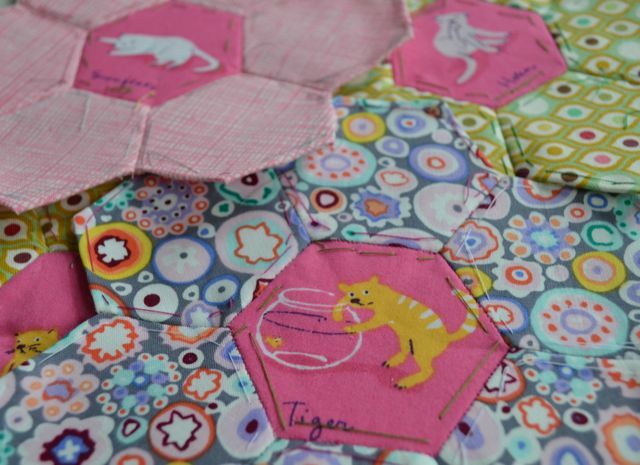 My hexies are slowly getting there first baste finished. It might get Hexy MF in the next year or so. ;) Depends on how fast my daughter prods me to complete. Thank you so much for this post. 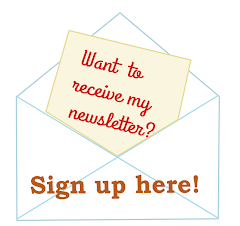 I want to let you know that I posted a link to your blog in Creative Busy Bee Craft Inspirations, under the Page 1 post on Aug. 11, 2012. Thanks again.